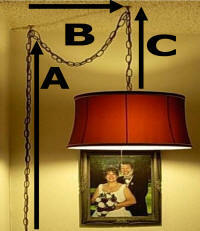 1) Hanging lamp is to be centered over a table that is 48 inches wide. 2) Table center is located 4 feet away from the wall. 3) Ceiling is 8 feet tall. 4) Lamp top to be located 3 feet down from the ceiling. Using the photo above, easily calculate the cord length needed (A+B+C). Total = 15 feet of cord needed and 12 feet of chain - Chain is normally 3 feet shorter than the cord but we can make the chain and cord any length and any color. We have been making hanging swag lights since 1979. If you need assistance in selecting the correct size for your room, let us know. The backbone of our business is personal service and that is why we do not use a shopping cart on our website.